Tom Harding’s one-bedroom apartment is cozy. Nestled on the western edge of downtown on Adams Street, it offers everything a 62-year-old could want: It’s within walking distance of a grocery store and entertainment as well as a short hop to a popular brewery. Outside his living room window is a view of a courtyard – from which the Cornerstone Courtyard apartments get its name – with large potted plants he tends to in the summer. And on almost every wall is a picture of his 10-year-old tabby cat named Tiger. It’s modest, by any stretch, but for the past 12 years, the Spokane Housing Authority-run complex has been a point of pride for Harding. However, for the past month or so, that pride has been stripped away and replaced with frustration and worry. 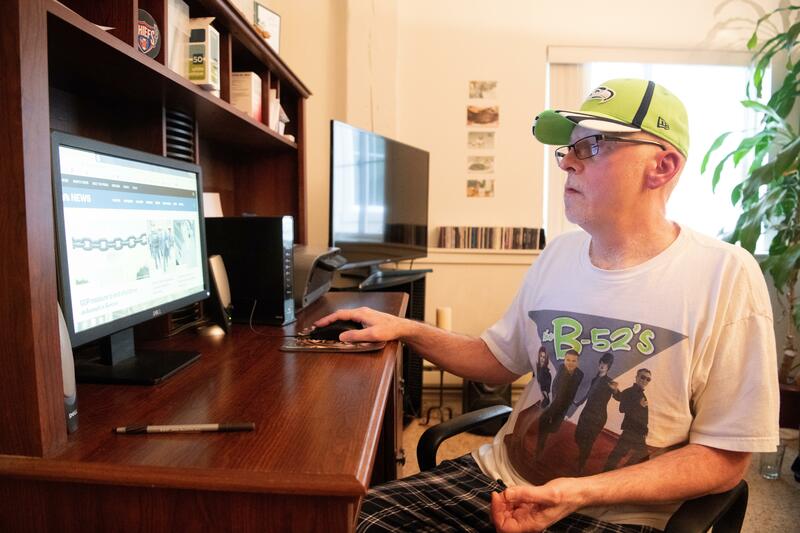 Like thousands of others in Eastern Washington on the edge of homelessness who rely on government-subsidized housing assistance, Harding has been left in limbo while the partial government shutdown barrels toward its sixth week with no definitive end in sight. The Department of Housing and Urban Development – among the agencies most affected by the shutdown – soon won’t have the funds to pay landlords. The Spokane Housing Authority, which distributes vouchers to about 5,200 households in the six-county area, has told landlords HUD payments are good through February. Pamela Tietz, the nonprofit’s executive director, said if the shutdown continues, she plans to send a note to tenants and landlords about next steps. Tietz said she hoped landlords would remain steadfast until HUD can process payments again, but in rural Arkansas, one landlord’s patience wore thin. Annette Cowen, a manager of 50 properties in Nevada County, sent a letter on Jan. 11 to tenants saying they would be evicted if they failed to pay their full rent. Typically, in a Section 8 project-based rental assistance program, like the kind in which Cowen was a partner, tenants are required to pay about 30 percent of their income on rent, while the federal government covers the rest. Those properties also set aside at least 40 percent of their rental units for low-income people, including families, seniors and people with disabilities. Vouchers, meanwhile, are portable, and renters can take them to properties that allow the service. While Cowen eventually backpedaled amid local media stories and pressure from federal officials, it hasn’t done much to quell fears of tenants. Terri Anderson, a Spokane-based community organizer for the Tenants Union of Washington State, worried that six Section 8 project-based properties in the Spokane area – four in the city and two in Spokane Valley – would feel the tightest squeeze, since their contracts have expired during the shutdown. That means those properties likely won’t receive payments in February or March. Cindy Emery, the manager of Pioneer Park Place operated by Spokane Housing Ventures, said last week the nonprofit was continuing to receive payments in January from HUD and voucher payments from Spokane Housing Authority. But it didn’t give her much promise. In north Spokane’s Lilac Plaza Retirement Community, a 220-unit property on Division Street, resident Norma McCarthy is concerned about how her neighbors will fare if asked to cover additional costs in March and beyond. The Landlord Association of the Inland Northwest, however, assures low-income renters that its members have no intention of serving evictions. At an association town hall Monday attended by more than 100 landlords, association President Steve Corker said the topic was heavily discussed. Corker, who himself runs two Section 8 units out of the four-unit apartment building and 13 homes he owns, said he had money set aside to cover the cost if the shutdown continues. He said he also hasn’t talked to a single landlord who has mentioned the government’s action would be a reason for them to evict. Same goes for Catholic Charities of Spokane, among the Inland Northwest’s largest providers of low-income housing. Across Eastern Washington, the nonprofit runs about 1,000 units. Scott Cooper, the director of parish social ministry, said Thursday that planning began in December ahead of shutdown murmurs, and as such, funds were set aside to cover the cost for a few months. He said eviction wasn’t a topic among top staff. Even so, Spokane City Council President Ben Stuckart said he was talking with city staff to see what can be done in the event the shutdown continues for several months and the city is faced with a massive influx of evicted low-income people. One resolution he’s floated would take a portion of the state’s sales tax to bolster the county’s affordable housing trust fund. While politicians in Washington, D.C., search for a compromise, Harding wonders when things will turn back to normal.